WIDE CAB WITH LOTS OF EXTRAS: 36 inches between the side screens is the widest in the skid steer industry - lots of elbow room. Less fatigue on your feet with an ergonomically designed foot pedal location. 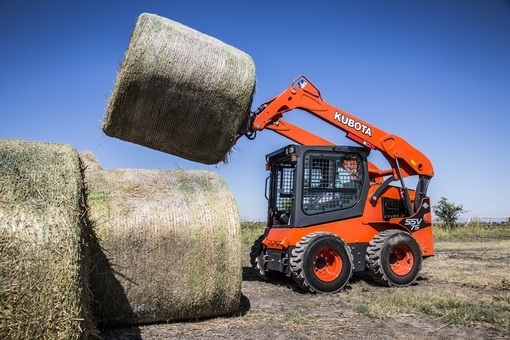 Easy effort Sliding Front Door for maximum visibility and no interference with loader arms. Standard side lighting to extend the work day. Standard, wide, rear view mirror. Side Windows on enclosed cab installed outside the side screen for easier cleaning. 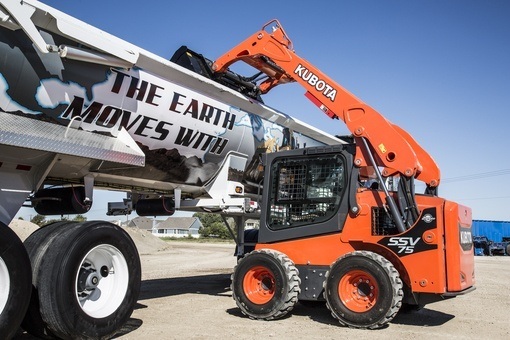 Bolt-on grab handles that can be replaced without compromising ROPs integrity. 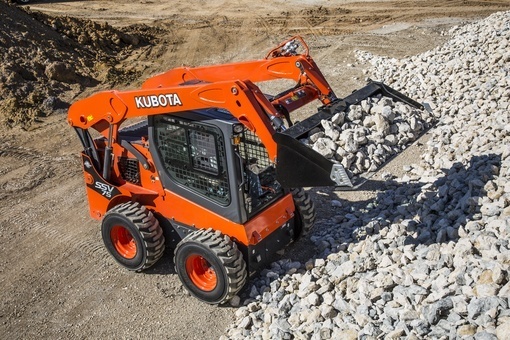 Tilt the cab with the loader arms up or down. COOLING SYSTEM AND VARIABLE FAN: Allows for more efficient engine cooling. Lessens noise levels. COMMON RAIL SYSTEM AND DIESEL PARTICULATE FILTER (DPF) MUFFLER: Better fuel efficiency. Auto regeneration, inhibit switch. EASY ACCESS TO ROUTINE CHECKS WITH MOST GREASE ZERKS RECESSED: The heavy rear door opens wide, providing access to all components including the battery, air cleaner, filters, and all fluid drains. STANDARD TWO-SPEED TRAVEL: Shift from low gear at 7.4 mph to high gear at 11.8 mph to get the job done faster. 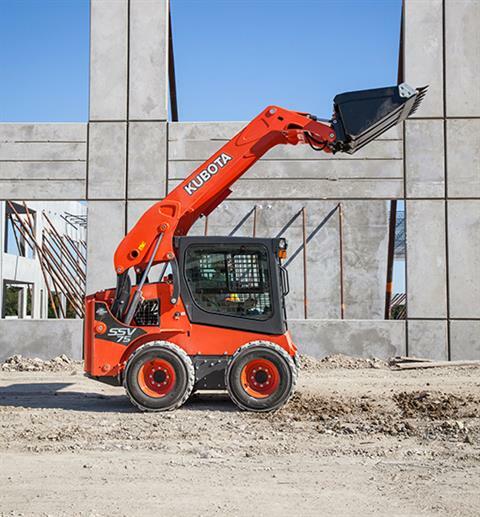 MULTI-FUNCTION LEVERS: The optional multi-function levers provide fingertip control of all major vehicle and attachment operations, including the main hydraulic line and three electrical lines, letting you keep both hands on the levers at all times for optimal operating efficiency. Horn, KSR, aux electrical control switch, aux electrical control switch or turn signals, single / two speed switch, aux electrical, control switch, aux electrical control switch, aux port variable switch for proportional flow, aux hold switch for continuous flow. MULTI-FUNCTION LEVERS (ISO PILOT CONTROLS): The pilot control optional multi-function levers are ergonomically designed for easy operation, better comfort, and less fatigue. 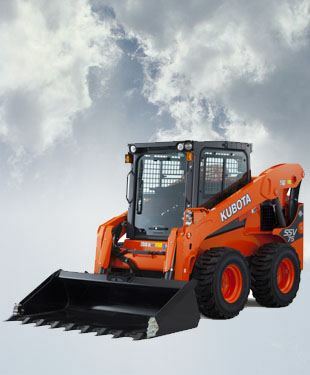 Just like with the foot controls, all major vehicle attachment operations are on the levers. KSR, horn, aux electrical control switch, single / two speed switch (trigger), aux electrical control switch, aux port variable switch for proportional flow, aux electrical control switch, aux hold switch for continuous flow, float (trigger). 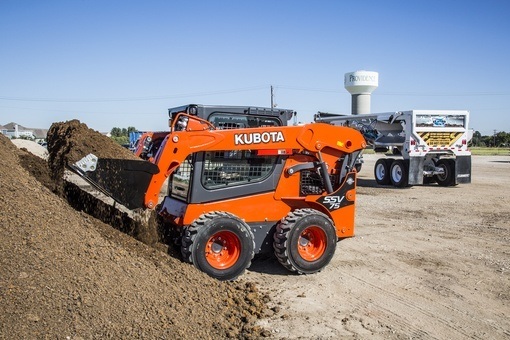 SELF-LEVELING FUNCTION WITH KUBOTA SHOCKLESS RIDE (KSR): The optional self-leveling function maintains the position of the bucket or folk as the attachment is raised, eliminating the need to manually adjust the angle during this operation. KSR helps minimize fatigue by "smoothing out" the ride. 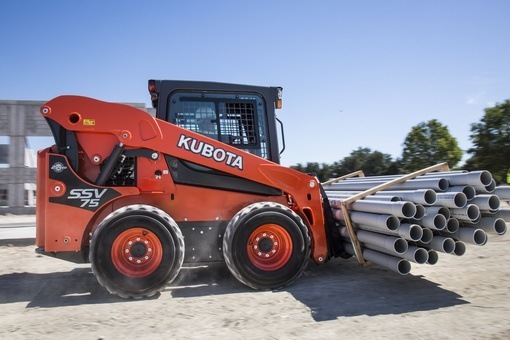 You'll appreciate KSR when carrying heavy loads over rough terrain on the farm or at a construction job site. 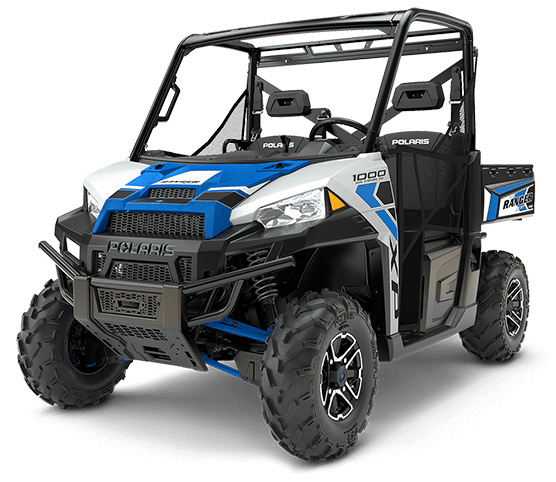 WIDE COMFORTABLE INTERIOR WITH FOLD DOWN SIDE BARS THAT PROVIDE GREAT WRIST SUPPORT AND PROTECT THE OPERATOR: Excellent 360° visibility, suspension seat, ready for radio installation, cup holder, 12V power outlet. OPTIMIZED AIR CONDITIONING: Optimized airflow through nine vents provides outstanding cooling and heating comfort throughout the year. 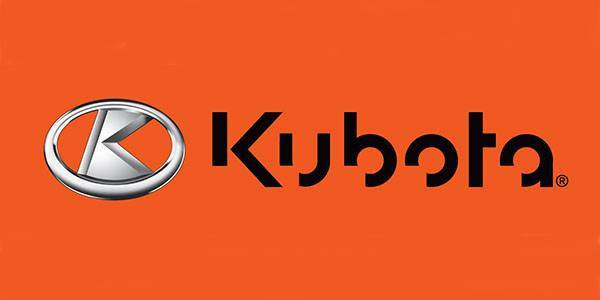 KUBOTA BRANDED VERSATILE ATTACHMENTS: Kubota Branded Versatile Attachments including buckets with cutting edges or teeth, pallet forks, grapples, brooms, bale spears, rotary tillers, augers, power rakes, snow blades, snow blowers, and so many more.